The World Trade Center Trieste, a division of SAMER Group, advances trade and investment opportunities in the region of Friuli Venezia Giulia. 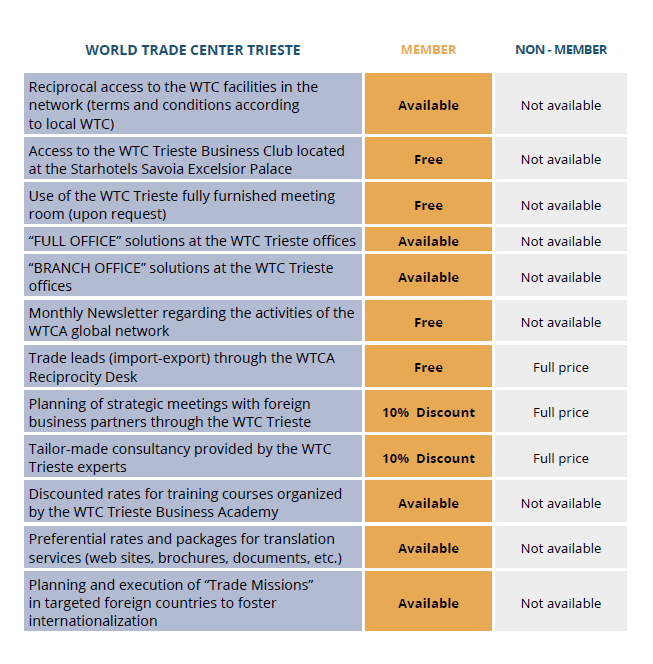 The WTC Trieste is a Member of the World Trade Centers Association (WTCA), which was founded in 1970 and is headquartered in New York City. The WTCA has exclusive rights to the “World Trade Center” and “WTC” brands, and serves as an international ecosystem of global connections and integrated trade services. The are more than 300 World Trade Centers in nearly 100 countries supported by 15,000 professionals. The WTC Trieste is located at Via San Nicolò 15 in the heart of the historic city center. The WTC building is a hub of activity driven by a dedicated team that delivers customized strategies and solutions to boost the international success of its Members and clients. We offer trade counseling and market research, training, educational and networking events, and group trade missions. All this aims to boost the international success of our Members. © 2016 - 2019 WTC Trieste, All Rights Reserved.